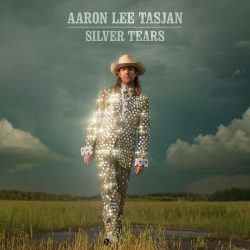 The cover image for Aaron Lee Tasjan’s latest release shows him sporting a two-piece suit entirely bejeweled with 10p-coin-sized silver sequins (or quarter-sized, in US coinage). Looking at this scaly, Stetson-wearing disco ball of a merman glisten in the sun, one can’t help but think “OK, this is going to be quirky. And not necessarily in a good way”. Fortunately, any suspicions of empty showmanship are dismissed from the very first moments of playback. The opener Hard Life is air-tight, with a 70s funky groove rolling slowly but assuredly forward, carrying playfully witty lyrics along with it. It sets the tone for the rest of the record nicely, “tight” and “70s” being keywords here. It looks like Tasjan (or ALT, as he’s conveniently referred to by BP Fallon in the album’s blurb), has scoured the entire decade’s worth of musical legacy for sounds and feels to use in his songs. Early Tom Petty, Cat Stevens, Ziggy Stardust, Grateful Dead, Neil Young, even George Clinton – all seem to pop up here and there in “Sliver Tears” compositions. The 70s throwbacks always sound like respectful tributes, never pastiche. The arrangements and production techniques used on the record reveal knowledge, good taste, and perfectionist attention to detail. Trying to spot all the possible influences shouldn’t distract from ALT’s individuality. There’s a unique voice in his writing style, and his lyrics have wit and layers to them that warrant multiple re-listens to fully appreciate. Switching from light-hearted to poignant, often within the same line, Tasjan’s maturity as a storyteller clearly shows. It takes a special kind of charisma to deliver a talking blues rant like 12 Bar Blues as compellingly – not a reflection on genre’s strict form but a complaint about too many drinking establishments to choose from. “Silver Tears” is a solid, full-fat proposition. If you can deliver an album that satisfying, go head, wear whatever the hell you want.